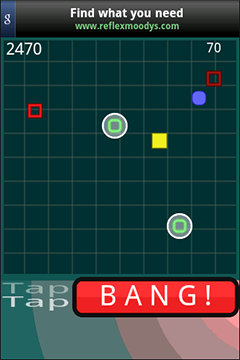 Simple yet addictive action game designed to test you reflexes and work your brain. Build combos for high score. An ever increasing number of coloured shapes are floating around the play area. You must select and explode the shapes before they crash. The different shapes have different speeds, so be careful when watching their paths. 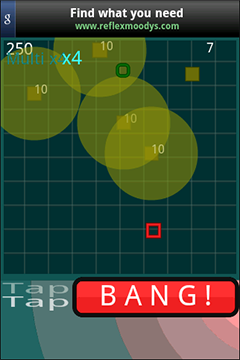 Selecting multiples of the same shape before exploding them increases the score. Various combos are there for the player to discover. Too many single explosions and the scoring stops! Select a shape by tapping on it. Explode by selected "B A N G". Watch out for the bomb shape (concentric circles) that will clear the screen of all shapes when exploded! 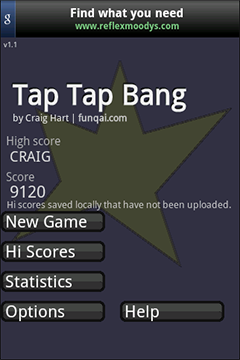 I believe there is an option to uninstall in Settings > Applications > Manage Applications > Tap Tap Bang. If that doesn't work, try restarting the phone and trying again.